Standard guest room with king bed or 2 double beds. Room includes bathroom with shower, cable TV, writing desk, telephone, balcony and coffeemaker. Deluxe junior suite with king bed. Suite includes separate living room area with sofa bed, kitchenette, refrigerator, coffeemaker, hairdryer, microwave, electronic grill, writing desk, satellite TV, balcony, phone, dishes/cookware, sitting area, in-room safe, dining area, and iron/board. Deluxe two bedroom suite with king bed and 2 double beds. Suite includes separate living room area with sofa bed, kitchenette, refrigerator, coffeemaker, hairdryer, microwave, electronic grill, writing desk, satellite TV, balcony, phone, dishes/cookware, sitting area, in-room safe, dining area, and iron/board. Deluxe three bedroom suite with king bed and 2 double beds. Suite includes separate living room area with sofa bed, 2 bathrooms (one with tub, 2nd with shower), kitchenette, refrigerator, coffeemaker, hairdryer, microwave, electronic grill, writing desk, satellite TV, balcony/terrace, phone with direct dial, dishes/cookware, sitting area, in-room safe, dining area, and iron/board. Take Airport Boulevard to the end of avenue, turn to the right and the hotel will be on your left after passing the Marina, just 5 minutes, first hotel on the northern hotel zone. 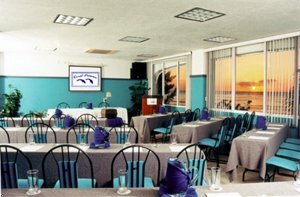 * El Galeon - open 7am-11pm, casual, International cuisine. * Pool Bar - open 10am-6pm, casual, bar. * Chirlobyrtos Bar - open 4pm-midnight, casual, bar. * Restaurante Buenaventura Terrasse, Cuisine Type Local and International a la Carta Menu & Buffet, on site, open from 7:00 am trough 11:00 p.m. Dress Code Casual (No wet)A/C area and open air terrace with incredible view to the Caribbean Sea and Sunsets. * La Palapa Bar, Cuisine type Snack, Local and International a la carta Menu. Grill's every Tuesday, Thursday and Saturday, On property near pools and beach, open from 7:00 am trough 11:00 p.m. No Dress Code * K8 Bar, snacks, located in our lobby area, open from 4:00 p.m. trough 11:00 p.m. Karaokee, Music and Video bar with pool table. 3.72 miles to the property. One meeting room is available for use, with a capacity of 100 people.